Although today it might seem like everything praised in an Instagram story is truly something amazing, something to put on your bucket list, beware, because that bubble might just easily burst like mine did in this one restaurant. And exactly that is what I did. 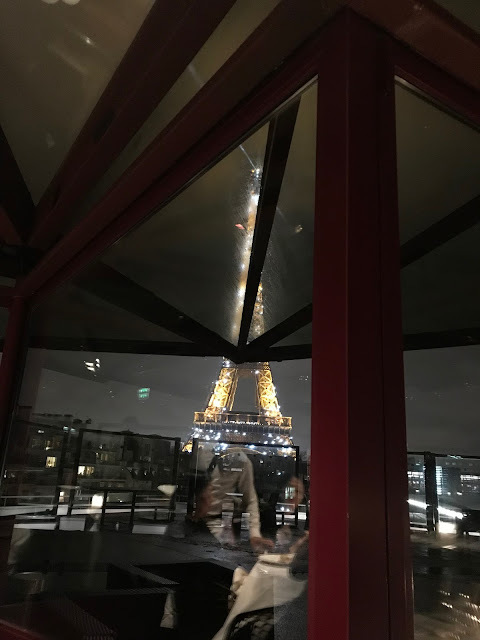 Arriving, not a problem, table, perfectly well-placed in the glass corner with an amazing view of the Eiffel, but to order, a mission impossible I wasn't able to complete. Apparently, although the menu suggests that you can choose whatever you want to eat (with a separate offer of a complete dinner menu of course), doing so causes the wrath of the shocked waiter that instantly disappears, just to resurface with the manager. And, apparently, taking dessert with a cocktail as a starter is also not a sight liked in this venue. beware, because although maybe not all of us are looking the part (at least how you envision us), customers should not be treated that way. Whatever might it mean that "bar experience is not served here" and "people come here for the food experience" comments we got while sitting and negotiating, I will not even bother with, but the down bar is: Why do you offer separate choices than on the menu? Maybe a question that you should find the answer to first. P.S. For those of you that already know me, and for those of you that get to know me now, I do respect all policies of the places I go to, but some do seem unreasonable from time to time, at least my honest, blonde opinion on this matter, I don't doubt the quality of the food, but the freedom of choice XD.